13-Jan-2018 -- From 35S 139E I continued eastward, crossing the Murray River. Then, at the town of Tailem Bend, I headed north-east, eventually passing through the farming town of Karoonda. I then took a (wide, smooth) gravel road heading northwards, passing less than 300 m west of the point. I did not visit this point during my previous visit to the Adelaide area in 2000, but several other people had visited it since, as it’s so accessible. 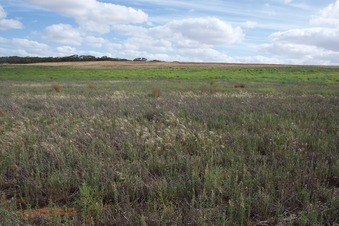 Some of the previous visitors had seen a cereal crop growing in the field. During my visit, however, the field was fallow.